PSNews - Quyet Thanh pottery village, which is located in Que town (Kim Bang district, Ha Nam province),was founded in 16th century or about 500 years ago. It used to be called Dinh Xa village, specializing in producing wine bottles, teapots, potsfor famous Vu Dai village to cook fish dishes. Recently, Quyet Thanh village's products have been exported to Japan, HongKong, US, to name but a few. Quyet Thanh or Dinh Xa village is 5 km away from Phu Ly city. Since 1959, local authorities have officially renamed the village Quyet Thanh, and the traditional pottery industry has been restored ever since marked by the birth of a pottery co-op. At first, pottery was only produced in Ha village. When pottery products were well sold on the market, pottery production was expanded, attracting labors from neighboring villages. Later, pottery production spread over several villages, but Ha village-based co-op Quyet Thanh was still the hub of the area’s pottery production. However, pottery products had then to make way for stainless steel cookware in the later 1990s and the early 2000s. Quyet Thanh Pottery Co-op was closed. Many kilns were abandoned and pottery production shrank. Pottery makers had also to peddle their products around. Of the total 200 households, only 70 still produced pottery products at a low pace and on a small scale. 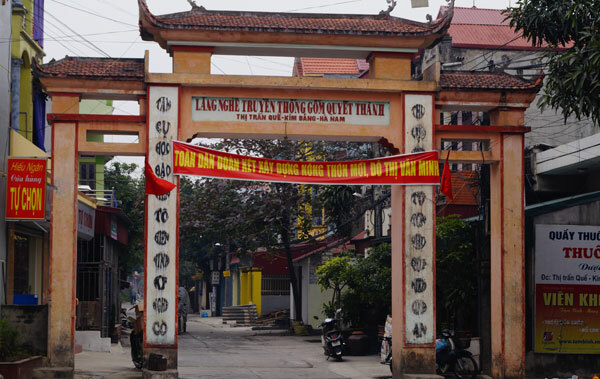 In 2004, Quyet Thanh village was recognized as a traditional craft village of Ha Nam province, and Quyet Thanh Pottery Co-op was reestablished. Since then, various products with golden color have been widely promoted at home and overseas. Skilled pottery workers have been recognized for their contributions to the development of pottery. Pottery production in Quyet Thanh village has gradually been restored, and Quyet Thanh pottery has become a renowned brand. Thanks to the enthusiasm and creativity of pottery partisans and workers, Quyet Thanh village now produces 6 million products per year, mainly including wine bottles, teapots and cooking pots. They are distributed in many provinces, including Hanoi, Ha Giang, Thai Binh, Thanh Hoa and some Southern provinces. Although there are only 5 kilns, including just one invested in with high technology, the Quyet Thanh Pottery Co-op is still creating a large number of pottery products with various styles and shapes, preserving and fostering the traditional craft. Quyet Thanh pottery wine bottles have been well-known for their mysterious use. Many people admit, if alcohol is contained in a bottle or jar for a while, the alcohol will be detoxified. Thao, a wine dealer from Hai Phong just arriving in Quyet Thanh to buy pottery bottles said:"I've heard about the mysterious use recently. I am studying that mysterious use of the Quyet Thanh pottery products and planning to combine my traditional home-made wine and Quyet Thanh pottery to create detoxified new wine." 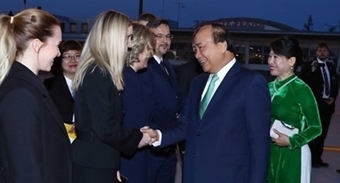 Nguyen Duc Phu, Chairman of the Quyet Thanh Pottery Co-oprevealed: "Thanks to the given natural climate, Quyet Thanh land is different from others. That is why our products could discharge aldehyde while still preserving the flavor of the wine and its concentration of alcohol. Quyet Thanh pottery teapots are also famous for making tea as tea made in the pottery teapot can smell and taste beeter and be preserved for a longer time." This phenomenon is still scientifically inexplicable, according to Mr. Phu, but there are many famous wine and tea brand sever coordinating with Quyet Thanh village. Although many ups and downs, Quyet Thanh pottery village gradually develops its own brand and produces various products sold on both domestic and international markets. It has received for a Fine Ceramics Brand certificate in 2010 from the Ha Nam Science and Technology Department.